The name Shangri la is a fictional Himalayan paradise described in a Novel by James Hilton called Lost Horizon. Several places from India to Tibet claimed to be the inspiration of this novel. In 2001, China renamed Zhongdian 中甸县 to Shangri la 香格里拉县 to attract tourists. It takes 11 hours via sleeper bus from Kunming to get there. It costs RMB176($25) and surprisingly comfortable. I slept the whole way. We were there hoping to catch the Horse Racing Festival which happens sometime on the 5th month of the lunar calender, which generally falls on mid June. We were a week too early but there were places to explore around here. And the most remarkable being the surreal scenery of the sky, meadows, and snow capped mountain. I will not contest it’s claimed name. The Old Town is going to be the main attraction. 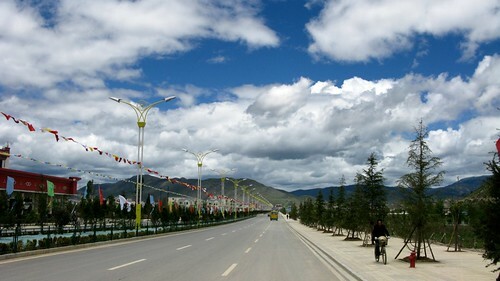 It’s a section of the town where traditional Tibetan culture were showcased. New buildings in traditional designs were built around the old buildings making it to a huge cultural village. It was full of shops and several restaurants and hostels. In the evening at 6pm, the villager come to the center to dance. In my opinion, it’s kind of Disneyland-ish. I was a bit dissappointed because I thought I’m coming to an authentic Tibetan town. I can see that there is a big plan for this county, serious building/construction is going there. 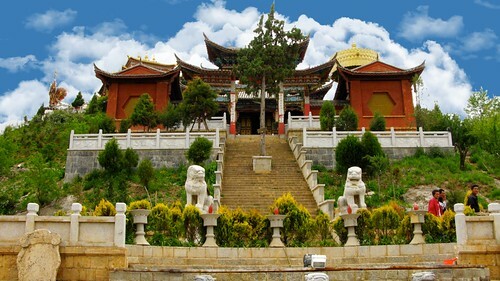 松赞林寺 Karma Dan Hut is one of the most famous Buddist Temple and Monastery in Yunnan, bordering Sichuan and Tibet. It was (said to be) built in 1679 with the location personally chosen by then Qing Emperor Kangxi in one of his “13 Forests”, in response to the petition of the 5th Dalai Lama. It is also one of the biggest with over 33 hectare in area. 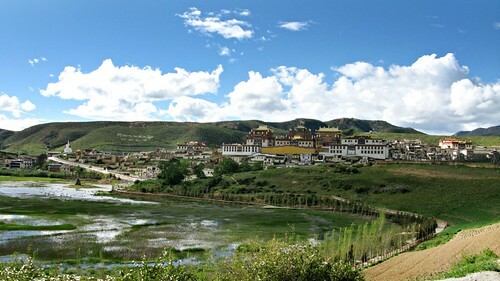 It is an elegant castle like structure inspired by the Potala Palace in Lhasa. 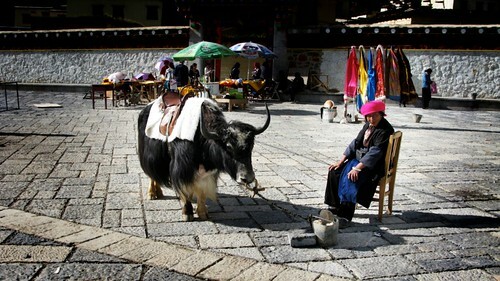 In 1993, it was declared a cultural heritage protected site by the Yunnan province government. From just outside the old town, take the bus to Road#3 until the end. We were charged with a surprisingly expensive RMB30($4.5) per person and I just found in the Chinese websites that entrace fees were just RMB10($1.5) for local tourists. 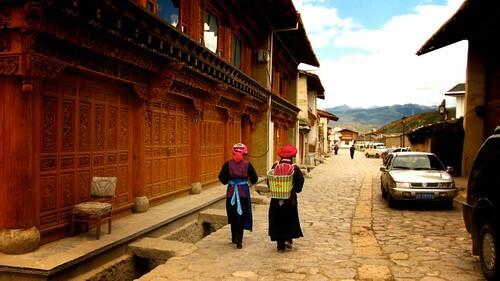 We wanted to find a Tibetan village but this place is already very developed that I think even if it’s a Tibetan populated village, it’s going to look like any other town. We may have sounded silly asking to find one. Were we expecting to find a backward village with no water system and fire born from rubbing woods? While we wander, we came to a tent in the middle of the vast meadow with a family sitting. It was about noon time and they called us to join them. There was a couple with 2 beautiful children with rosy cheeks, a man who is the uncle of the kids, and 2 elder ladies in their colorful Tibetan costume. They offered us interesting food like salty milk tea, salty bread, cheese and spicy tofu. Except for the 2 old ladies, all of them speaks Mandarin so we were able to interact with them. They have cellphones, cars, and talk of relatives in Italy. They also told us the exact dates of the Horse Race festival. We ended chilling out with them for a while and wait for the rain to stop. this ranks high in my must-go-places! luv the vibe!!! Your photos are gorgeous. They certainly capture your words. Too bad it wasn't the off the beaten path experience you had hoped, but running into that family in the end sounds like a rich experience. And the photos are very picturesque! May I know what camera you use?